When I bought my first dirndl, the shop lady insisted on bringing me one size smaller than I usually wear. "The breasts don't go in the dress," she explained. Then she asked me if I were single or taken, which I thought was a bit forward after all this talk about my bosom. Turns out she just wanted to know whether to tie my apron bow to the left, or to the right. Sisters Darouiche and Rahmée Wetterich started the brand NOH NEE in 2010. They were born in Cameroon and now call Munich home. 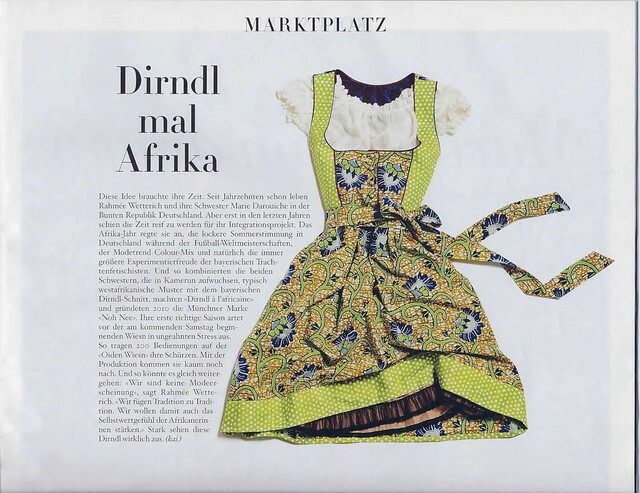 What I love about the brand is their whole philosophy of "colour mix" - to hear the sisters talk about dresses makes you want to vote them into German Parliament: “(Colour mix) will be of great importance in the days to come....people will get to know each other, they will innovate, and they will see their own traditions in a different light." In Germany, people talk more about "integration" than they do about "multiculturalism". This dress gives me hope for something in the middle.